Thousand Mile - Comfy, Easy Care Gender Neutral 100% Cotton Shorts, Longer, for Guys & Gals. MADE IN USA. 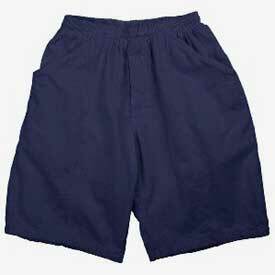 Easy Care 100% Cotton Longer Comfort Shorts. You'll want to wear these Comfort Shorts everywhere! 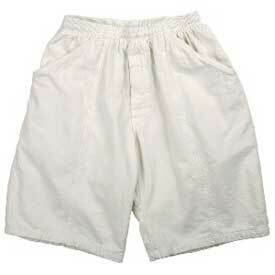 The longer inseam (about 11 inches) and relaxed fit will make these Casual Comfort Shorts your favorite. Made from 100% Cotton Campcloth, the same cotton used in our sweats, is both soft and easy to care for. They are a longer length that touches the knee for good coverage and they also have a full crotch gusset which allows for mobility when you're active and on the go. 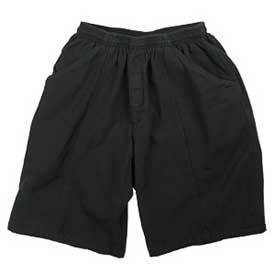 Super deep pockets are lined with a soft cotton and the drawstring elastic waist add practicality to these shorts. GENDER NEUTRAL Sizes S, M, L, XL, 2XL . Check our Sizing Chart for measurements. 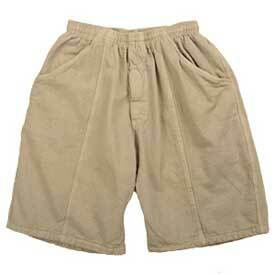 These shorts have two 8-12 inch deep pockets, see photo. 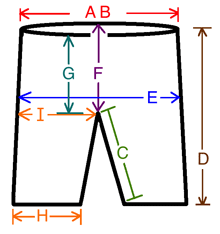 A: Relaxed Waist Circumference, measured w/o pulling waist band tight. 26" 26" 27" 30" 31"
B: Pulled Waist Circumference, measured pulling waist band as far as possible 38" 40" 41" 43" 49"
C: Inseam: Crotch to bottom of hem 10.5" 10.5" 11" 11" 11.5"
D: Outer Seam: Waist to bottom of hem 19.5" 20" 21" 22" 22.5"
E: Hip Circumference: measured around widest hips (8" down from waist band) 47" 48" 49" 51" 53"
F: Back Rise: back waist band down to crotch seam 12.5" 13" 13.5" 14" 14.5"
G: Front Rise: front waist band to crotch 10" 10.5" 11" 11.5" 12"
H: Leg Hem Circumference 24" 26" 26" 28" 28"
I: Widest Leg Hip: Widest part of hip fabric from crotch to side seam 16" 16" 17" 17.5" 18"